Among many things, Marni and I share a favorite holiday. It’s probably no surprise that it happens to be Thanksgiving- a celebration of family, friends, eating and indulging. After the epic afternoon feast, we set our sights on the tantalizing pies. Marni always seeks a piece of savory, flaky apple while I never stray far from a slice of velvety pumpkin. Last year in standard Twin Tastes fashion, we challenged ourselves to revamp the classic pumpkin dessert by whipping up some delightful Pumpkin Whoopie Pies. This year, I would like to revamp the classic once again. As I looked at the auburn-colored tree outside my kitchen window this past weekend, the flavors and colors of fall resonated. My mind was swirling with cinnamon, caramel, and pumpkin spice as I experimented with dessert recipes. Every Christmas, Marni and I make our Mamö’s Berry Trifle, so I thought why not concoct a pumpkin trifle for Thanksgiving? Trifles are the best dessert with layer upon layer of cake and cream, and a lovely alternative to pie. In our Christmas trifle, we always soak the Angel Food cake cubes in Grand Marnier. 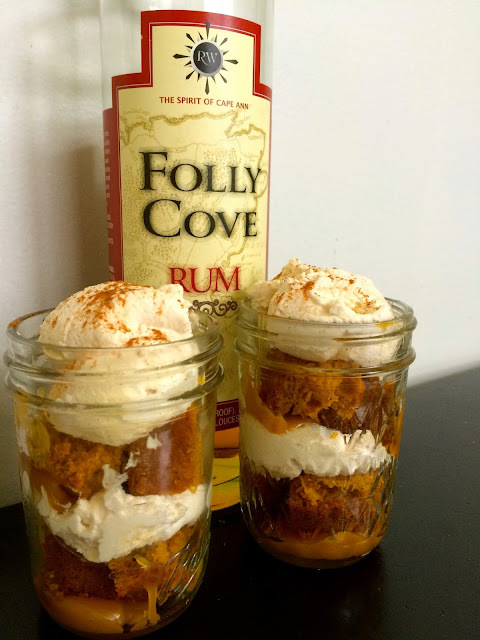 Following that kick, I decided to use Ryan & Wood Distilleries' Folly Cove Rum to infuse pumpkin cake. Between each layer of boozy cake, I heaped a fluffy spiced mascarpone cream. For a touch of sticky sweetness, I added tiny spoonfuls of Fat Toad Farm’s Cinnamon Goat’s Milk Caramel. Line a 13 x 9 baking pan with parchment. In a medium bowl whisk together the flour, baking soda, baking powder, salt and spices and set aside. In a separate bowl, whip the sugars and canned pumpkin with an electric mixer until smooth. While beating, stream in the vegetable oil and the eggs- one by one- until fully incorporated. With a wooden spoon, gently fold the dry ingredients into the wet ingredients until incorporated. Pour the batter into the prepared pan and bake until golden brown, about 19-20 minutes (keep an eye on the cake- it's quite thin!). Once cooled, cut the cake into 1-inch cubes. In a chilled bowl, whip the heavy cream until soft peaks form. Add the vanilla extract and once incorporated, set aside. In a separate large bowl, add the mascarpone, sugar, and spices. Whisk until fully blended and creamy. In batches, fold in the whipped cream with a wooden spoon into the mascarpone mixture. Be gentle and do not over mix. Pour half a teaspoon of caramel sauce into each mason jar. Next, add three to four cubes of pumpkin cake, lightly pressing into place. 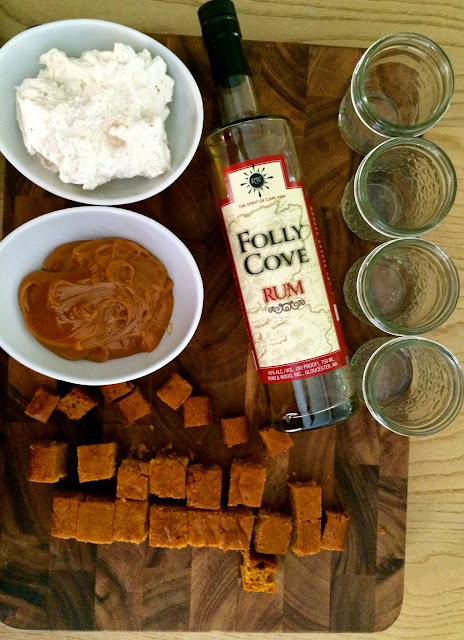 Using a brush, lightly soak each cube of cake with rum. Drizzle with more caramel and top with a heaping spoonful of Autumn Spiced Mascarpone Cream. Repeat the above steps until you reach the top of the jar. Sprinkle the top of the Autumn Spiced Mascarpone Cream with a dusting of cinnamon. 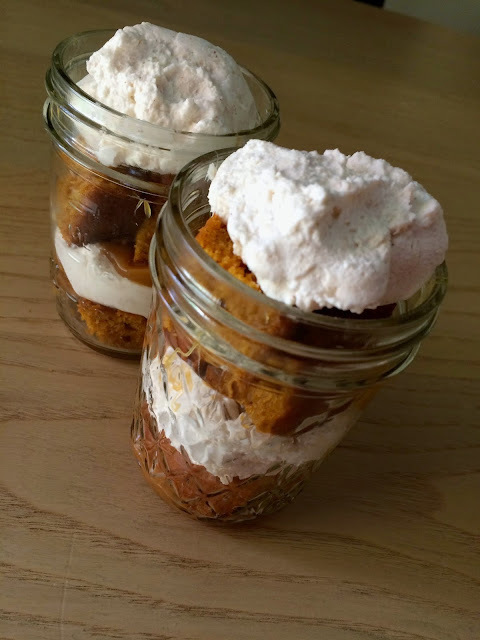 Makes 8 mason jars- with extra pumpkin cake to spare! The individual layers can be made hours ahead of time and chilled in the refrigerator before enjoying. If you prefer to assemble the layers in one large trifle dish, by all means go ahead! Either way, you have a fantastic fall-themed finale.